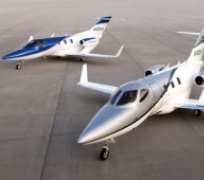 Honda Aircraft Company has been working on the HondaJet for more than 20 years and now has started deliveries of the $4.5 million airplane in both North America and Europe. In April, at the Aero Friedrichshafen general-aviation show in Germany, the first European delivery was made to Rheinland Air Service, a dealer who will promote the airplane to the business-aviation market. Customer deliveries for the United States began from the company's headquarters in Greensboro, N.C., in December. New pilots are being trained there in a full-motion flight simulator before moving into the jet cockpit. In March, Mexican authorities also certified the jet.